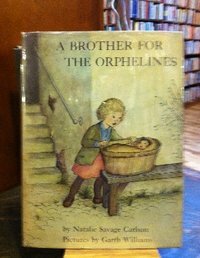 When The Happy Orpheline was published, The Horn Book said, "Little girls will wish the book were longer! Garth Williams' strong pen-and-ink sketches, full of life and laughter, match the imagination and French flavor of the writing." Now there is more about the happy orphanage in France. The orphelines, still filled with zest and imagination, find a baby boy on their doorstep. Of course, they are utterly enchanted. The only question is how the twenty fond foster sisters are to manage to keep their new brother. Josine, the youngest, solves the problem in the most thoroughly satisfactory mannner. Once again Natalie Savage Carlson and Garth Williams have joined forces to give young readers a book they will treasure for years to come.